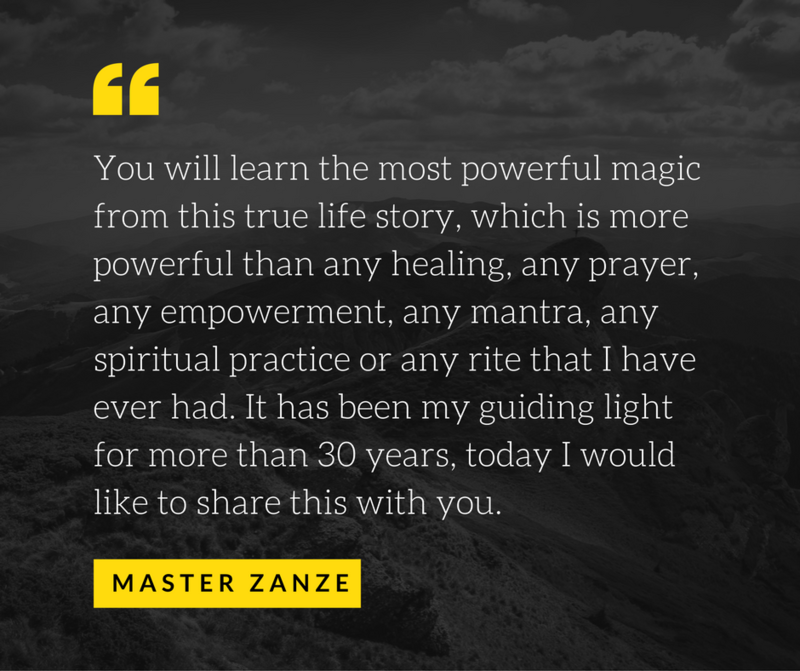 You will learn the most powerful magic from this true life story, which is more powerful than any healing, any prayer, any empowerment, any mantra, any spiritual practice or any rite that I have ever had. It has been my guiding light for more than 30 years, today I would like to share this with you. In early June 1981, the weather was very hot, my four children wanted to go for a walk, and I also wanted to go to the Hengyang Road Japanese bookstore to find some newly published book about hand-woven craft. When we passed Hengyang Road in the walkway of Taipei Communication Bank, an old man suddenly ran out of the the roadside fortuneteller stall and said, “You must have your destiny read.” I shook my head, waved my hand, and repeatedly refused him. I did not expect the old man suddenly became very depressed, as if hiding something. My elder daughter could not bear it. She took my hand and said: "Mom, let him read fortunes, okay? Support his work and let him earn money! This old man is so poor! " I did not like fortune-telling and did not have pleasant feeling about roadside stalls charlatans, but the compassionate kindness of the children made me feel that I could not bear to see the suffering and not help. The children had to pull me to the fortune-telling stall. The old man looked at my face, looked at my hands, and then looked at the faces and hands of my four children, and talked about the theory of destiny. Suddenly, he sighed loudly and said: "Never mind! No need to pay! All and everything is destiny, not a bit is up to us! " The children felt bad and insisted that I give the fortune-telling old man some money. I took out NT$3000 (US$100) from my purse and respectfully offered the gratuity with both hands, but the old man insisted no money, so that went on and almost made the children teary eyes. Finally, the children begged the old man saying that this is not the reading gratuity but it’s just their way of honoring him. The old man finally reluctantly accepted it, but he suddenly cried and cried very sadly. He had tears so much he’s red-eyed and his hands touched each child's head, muttering: "Oh! God has no eyes! God really has no eye! " The children said goodbye to him. He just bowed his head down and waved his hand heavily, so sad that he could not say a word. We did not know what’s the matter. We were passing the new park and saw a bunch of people surrounding something at the gateway. Kids love to join in the fun, so they squeezed into the crowd to find out. Just moment later, my children came back dragging me in. I did not want to squeeze in because it was too crowded, but the children just made such a fuss so I had to go along to see. Not only I did empty all the cash on me, but I also went to a nearby customer of my company to borrow a large sum of money. I then accompanied the lady to National Taiwan University Hospital and paid a huge amount of medical expenses owed. ​A month later, many ants suddenly appeared on our doorstep. They lined up like army marching into our home and covering the floor and the walls. I was afraid to step on them, so I quickly bought a dozen small bench and lined them up like a walkway bridge. I also sprinkled over the sugar, food and some water to take care of these ants hard work coming to visit. The children seeing so many ants covering the house were very afraid, but the children were listening to me to do no harm and to not bother them. The children understood "welcome the guests" and the way of hospitality. In this way, groups of ants swarmed and almost filled everywhere in our home for a few days before slowly dispersing. ​The children were on summer break and I was busy in the company. I could not spare time to go on a holiday with the children. I asked a lady from the company to take care of them at home. One day, I was in a company meeting and vaguely heard the television news in the reception room about a big fire broke out at Renai Road in Taipei. Since I chaired the meeting, I could not hear clearly but only that the fire is big. My home is on Renai Road. After the meeting finished at 4:30 afternoon, I asked my colleague to give me a ride home. The colleague who drove me home shook me awake from my nap. I must had been very tired that I fell asleep. I did not care about the fire and anxiously charged to the third floor, but was immediately grabbed by the firemen and the policemen. “Where are my kids? Where are my kids?” I cried loudly and struggled to break free. The firemen hosed down the fire for a safe passage and sent three firemen to take me to the third floor. My home’s iron front door was so hot I could not touch it and it’s expanded and stuck. The firemen broke the door down with ax so we could get in. Once inside we felt the heat and the smoke. I couldn’t see but cried out at the top of my lung my kids’ names. One by one, four children, and not a sound. By now, I was shaking and felt my legs turned jelly. I was about to pass out. I was really going crazy. I could not hold it together. Suddenly, the firefighters stepped on a bunch of people. My four children cuddled together and passed out on a pile of used books that we recently bought. The office lady passed out on another pile of used books. Firefighters, police officers and I quickly carry the children and the office lady down the stairs to the hospital for treatment. Fortunately, smoke inhalation was not too serious. Everyone gradually came to after emergency treatment in the hospital that night. ​The firefighters said that the floor was burned so hot, even the books were burned. If these kids were to pass out directly on the floor instead of the pile of books, they would all been burned corpses! The firefighters said, "Your family must have very good morality!" After the fire was extinguished, all my neighbors’ homes in the whole building and the neighboring building left and right were burned down. Not a single home survived except my home on the third floor. Unexpectedly, the fire seemed to skip my home. The firefighters said, "The third floor outside of your home was filled with smoke. We were trying to hose with water but could not see it. It seemed to have disappeared. Not a single drop of water was in your home!" The whole neighborhood was in flames. High temperatures close to my home’s walls roasted and bent the metal shelves. The thousands of books were also scorched and began to smoke, but not a single book actually flame up fire! The firefighters said, "This has to be a miracle! How could this happen? " If thousands of books flamed up fire, my four little children could not have survived. My home was full of books, which made it the most likely to catch fire! ​The crowd of witnesses were rushing to tell the reporters. "The third floor just seem to disappear in the smoke and you can see there are many people in white clothes in the smoke spraying water on the fire to keep it away!" My next building neighbor also came up, his third floor home is right next to mine. His home had three LPG cylinders. The fire melt them down to iron piles, but why did it not explode!? If there was explosion, then my four children and the office lady would surely scatter to pieces.! After I listened to him, I felt chill in my entire spine and broke out in cold sweat. Such close call! ​What a hectic month. Moved to a new home. September school started. The children wanted to buy some piano lesson materials, so we went to the bookstores on Hengyang Road. We passed through the walkway of the Communication Bank, suddenly sprang out the fortune-telling old man. He opened his arms, clinging tightly the children, very excited and very surprised asking, "How are you still alive? How are you still fine?" ​This time he was not hiding anything, straight off out of his mouth assertively said to me: "Your destiny should have no children. They should have all died in fire this summer! " That day he saw my four children are very compassionate and kind, so he felt that God does not have eyes. He cried sadly after we left that day that he had to close up shop early. He was very reluctant to see that my children will die, but he was helpless. He knows destiny for many years. As the saying goes, "The King of Hades destined you to die by midnight, who would dare to keep you alive till dawn! " He said, "I don’t have the ability to hold you alive!" He was very apologetic ashamed and blamed himself for not been able to do anything. I told the children to call the old man grandpa. The old man has no family and no relatives in Taiwan, we are his family now and he is the grandpa to my children! He cared so much about you four kids and he deeply love you, maybe it’s because of his tears, so the four of you survived such calamity. You luckily survived it! That year, my oldest child hadn’t graduated from primary school yet, the youngest one hadn’t been to kindergarten yet. I have two daughters and two sons. ​Lastly, the piles and piles of used books on the floor were blocking my kids’ space that we had to deal with it. These old used books came from an old man selling used books from a stall. I bought all his books that he couldn’t sell so he can make a living. The old man could not bear throwing out old used books and very few people today wanted to buy them. So he was breaking his back moving them every day. Who would have thought that these old used scrap books saved five lives! A person's life always has some unexpected things that we are unable to give a reasonable explanation, perhaps this is what we called "God”! So people may calculate whatever and sometimes they will just fail, because people sometimes forget that God also has a count! I have deeply realized that along the way of my life, how insignificance a person is. I think a person should never be too complacent, be too confident and be too arrogant. What an exemplary family of selfless action karma yoga! They are the great teachers that you and I should follow. They have the admiration of gods and ghosts. They have shown us the practice to Open Your Wisdom. All and every Buddha looks after them. Share generously with everyone. May all and every Buddha look after you!